Being mommy of two boys, I am busy with my parenting lifestyle and things that interest me. Say if you like contest, do check out the Dutch Lady 'Mak Kata, Saya Anak Bijak' Contest. This contest is happening since 1st August 2016 until 30th September 2016. Good news as 9 lucky winners and their family members will stand the chance to spend an afternoon with celebrity mom, Scha Alyahya and her daughter, Lara Alana at a tea party. Not just that the winner will receive one instant camera, how cool is that?! Be the first 250 weekly submissions will get RM50 cash voucher. I have also shared the info on my other blog, click on the link to read it. My mom is mommy of 5 children, I am the youngest in the family. It's not just about nutrition needs but also guiding them to achieve foundation milestones growing process. My mom always advice me to do homework first before anything else. 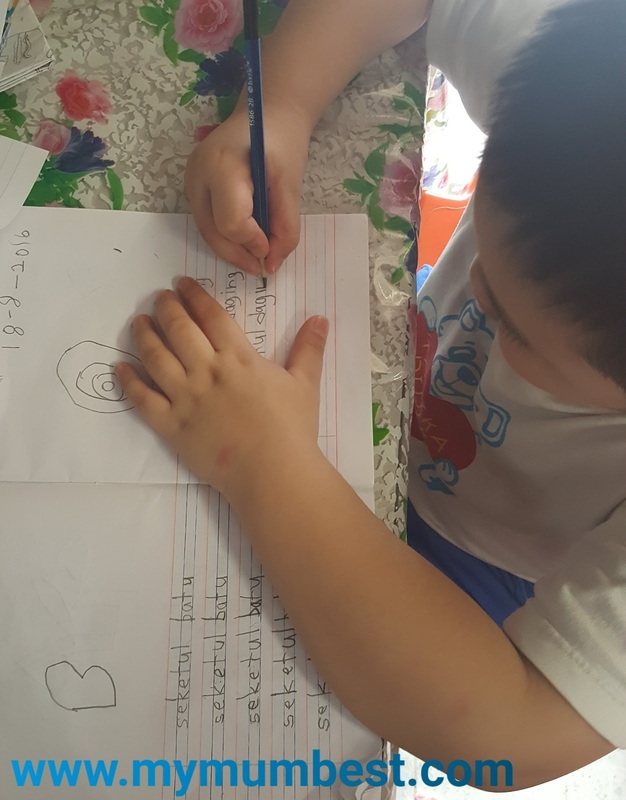 Same thing I am encouraging my son to do, Mak Kata do homework first before doing other things. So everyday I am checking my 5 years old son's homework. 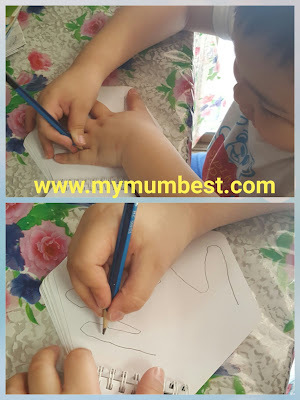 Mak Kata after homework can do some art, he's having fun learning to draw hand print of his hand. We wants children to have balance of education and also enjoy other fun activities we can do at home. Mak Kata never try, never know. He was afraid of mistake he will do, I says nevermind to him, we can learn from mistake. Mak Kata let him write his own name, practice makes perfect. He's 5 years old and learning to write his name on this cute bottle of Xmas decoration which I brought back. Mak Kata don't forget that not just indoor activities but also bonding time to learn together, it's Aquaria KLCC where we love to know more about the fishes. Mak Kata sharing is caring, my son Sean will build the Lego toys and then sharing it with his brother to show him the brotherly love. 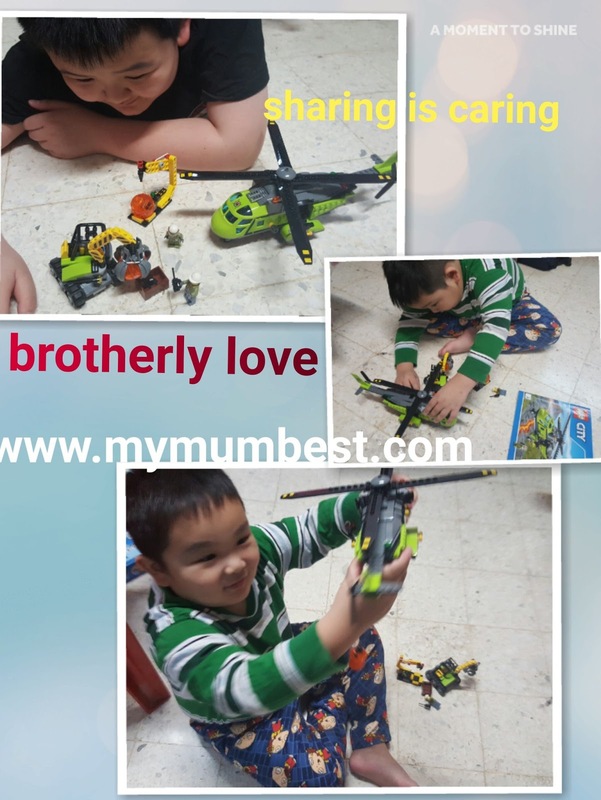 Sharing is caring, children grow up fast and best to enjoy their brotherhood together. Mak Kata love and care for each other, siblings love forever. Don't argue or fight, tolerate and grow together. Mak Kata before bedtime learn some alphabets letters, manage to capture short video of my son's learning. Nobody says that parenting is going to be easy, we are all in learning process and growing together with our children. "Mak Kata, Saya Anak Bijak" its a meaningful contest that you can take part with your children. We want the best for our children, I hope you enjoy my story of "Mak Kata, Saya Anak Bijak". You have many good tips. You are a good mom. Such a lovely mum you are, I'm sure your children would be proud of you one day! Nice contest from Dutch Lady! Good luck to those joining. wow...Dutch Lady have contest!!! When I was kid, I usually drink Dutch Lady!! Your kids are so adorable. Great contest from Dutch Lady. Such a nice and good mum you are! The words that you teach and advise to your kids is truly showing your caring and your love to your kids! Dutch lady is my favourite. I like how Dutch Lady implement something for the children to learn. What great tips your mom gave you. And now you are passing them on to your kids. love the contest tag line. Dutch Lady's milk is nice to taste also! Wishing you all the best in your entry! Took some effort to craft this very well.